I never thought a painting could make me cry, but here I am, thousands of miles from home with tears in my eyes. I was happily browsing and admiring the works in the little ‘Tangled Webb’ art gallery, here in St Helena Bay, South Africa when quite unexpectedly, I’ve recognised the subject matter in this piece and the emotions hit me. 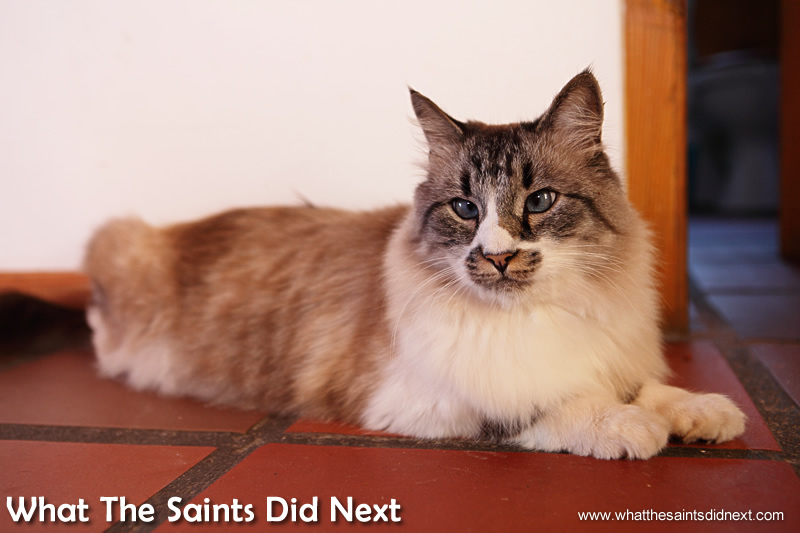 The painting is simply called, ‘A Moment In Time,’ by the artist, Diane Webb. It’s a scene she captured whilst holidaying on St Helena Island of an impromptu music session with guitar player Wayne Yon (my fellow St Helenian), sitting outside his house in Jamestown, singing Oasis’ classic ‘Wonderwall.’ A little girl rests her head on his shoulder. The thing is, I was watching this ‘moment’ just last night on a home video, which makes the painting so powerful and has brought on the tears. My spine is tingling; I can’t find words to express my feelings. All I can manage is a smile of appreciation to the artist, dry my tears and sigh. The moment I turned around and spotted the painting. ‘Banjo’ arriving at St Helena Island in the 2012 Governor’s Cup Yacht Race. The artwork has clearly been influenced by the ocean. The walls in this bright, whitewashed gallery showcases Diane’s work, and like ‘A Moment In Time’ there’s a story behind each painting. Yachts, birds and dolphins feature prominently. “It’s all about my life,” she explains. “It’s my family, Banjo (husband’s racing yacht), sailing, and everything that means something to me. 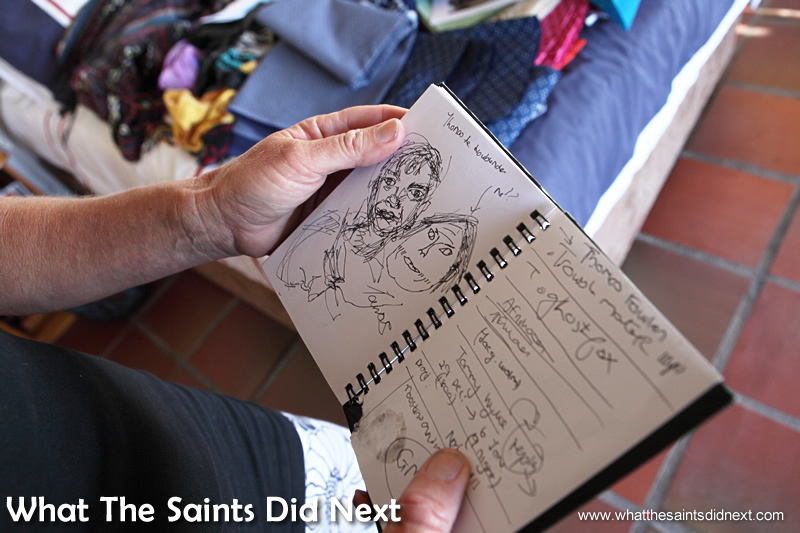 Without that subject matter I probably wouldn’t do things like this.” Her sketch book, which she carries at all times, is used to doodle and jot down ideas on the go. 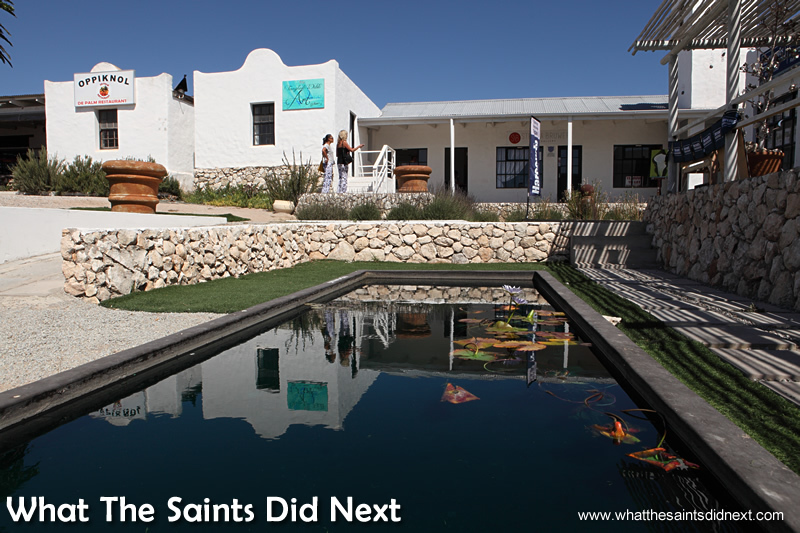 Tangled Webb gallery to the left, part of the little De Palm Lifestyle Centre in St Helena Bay, South Africa. On a tour of the gallery with Diane. Mixed media art at its best. Diane’s style is abstract. 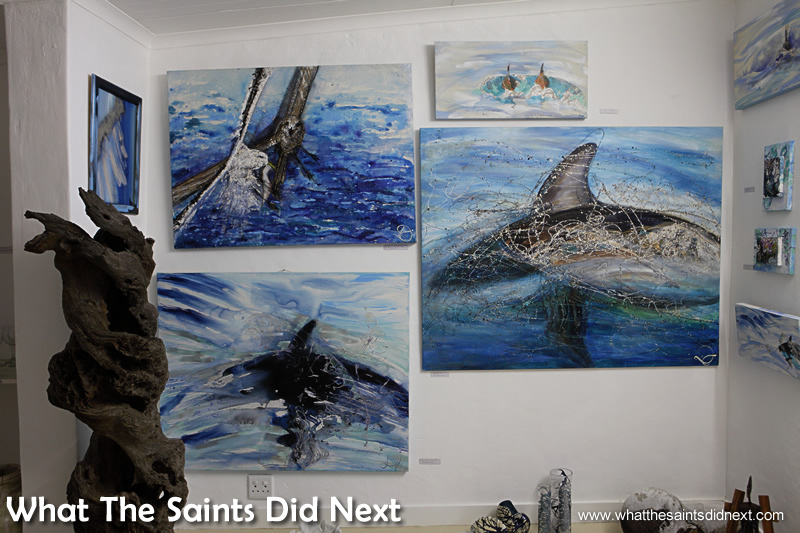 She specialises in mixed media; combining acrylic paints, charcoal, shells, sand, African beads, dried foliage and any other materials that take her fancy, to create specific textures. Her clever use of colour, light and mixed media gives an almost 3-D effect. 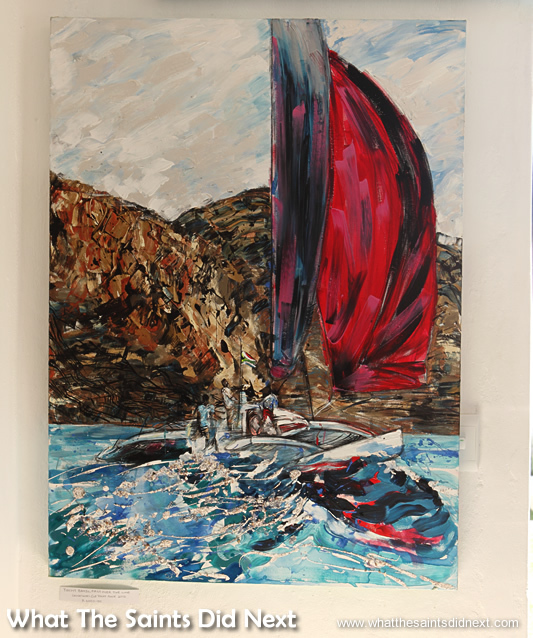 Another particular piece I’m drawn to is of Banjo winning the Governor’s Cup Yacht Race 2012, red spinnaker in full bloom speeding past St Helena’s rocky coastline. The blue ocean is so mesmerising I want to jump in. 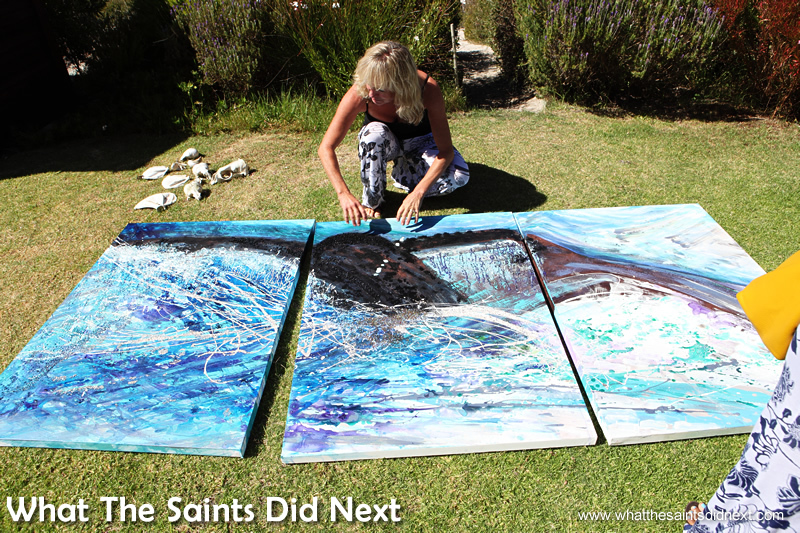 Sitting on an easel is a potential masterpiece; the start of the 2014 Governor’s Cup Yacht Race in Simon’s Town, South Africa. 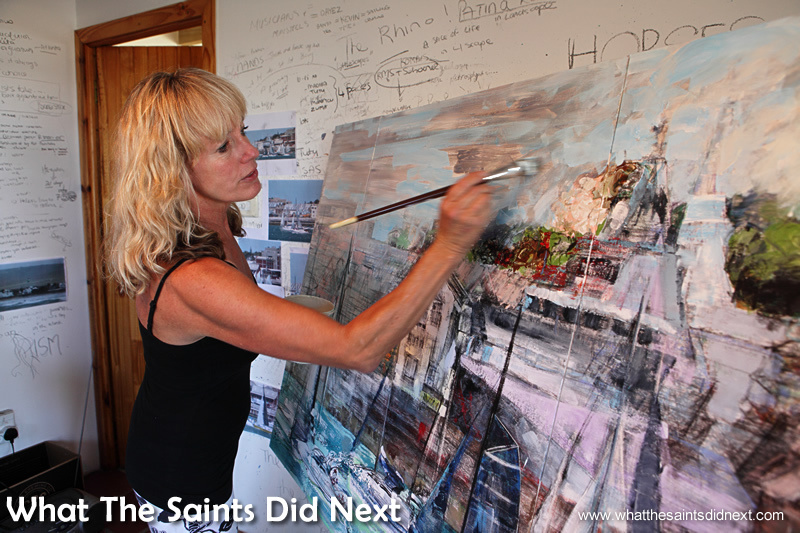 Diane working in her home studio on the start of the Governor’s Cup Yacht Race from 2014. A whale encounter inspired this painting which is still a work in progress. 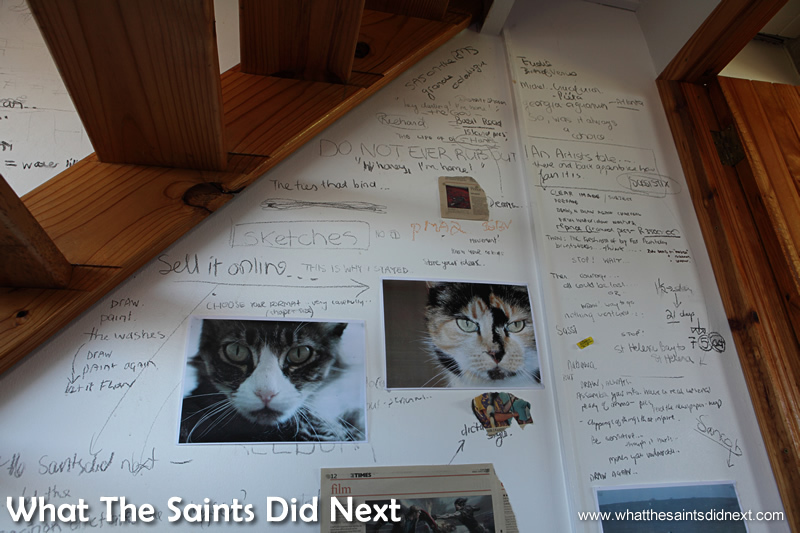 The inspirational graffiti wall in Diane’s studio. Drying in the shed is another work in progress, a whale’s tail lifting out of the water. This also has a story. Whilst out sailing, Diane snapped a chance encounter with whales, “It’s a bucket list photograph and I had goose bumps,” she recalls. Diane in her special creative space. A peek inside the doodle book. 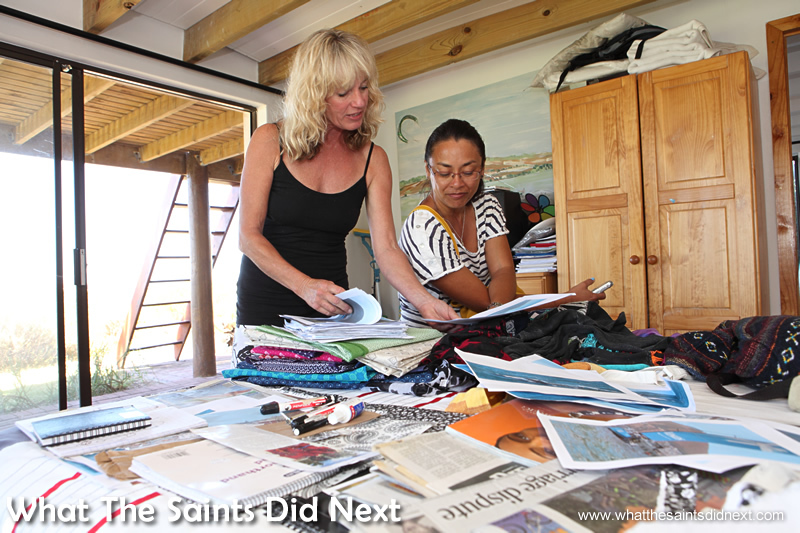 Browsing the treasure trove of materials that can be used in the mixed media paintings. 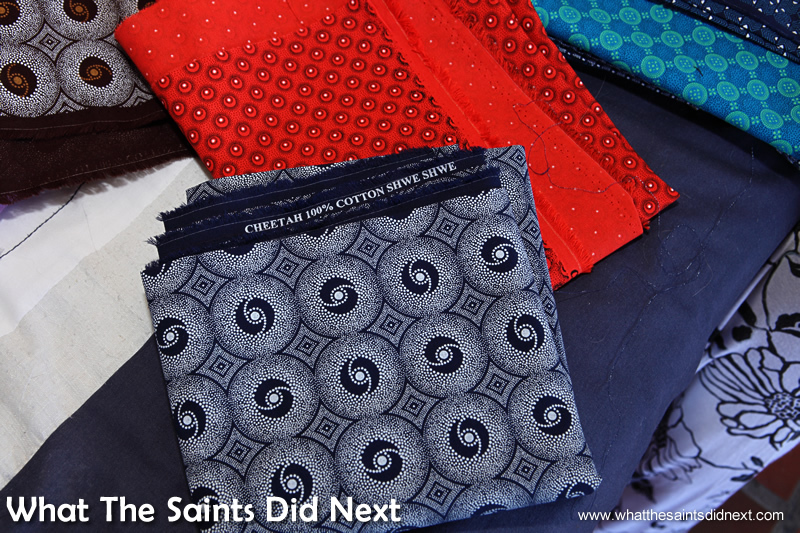 Some of the shwe shwe material to be used in future paintings. 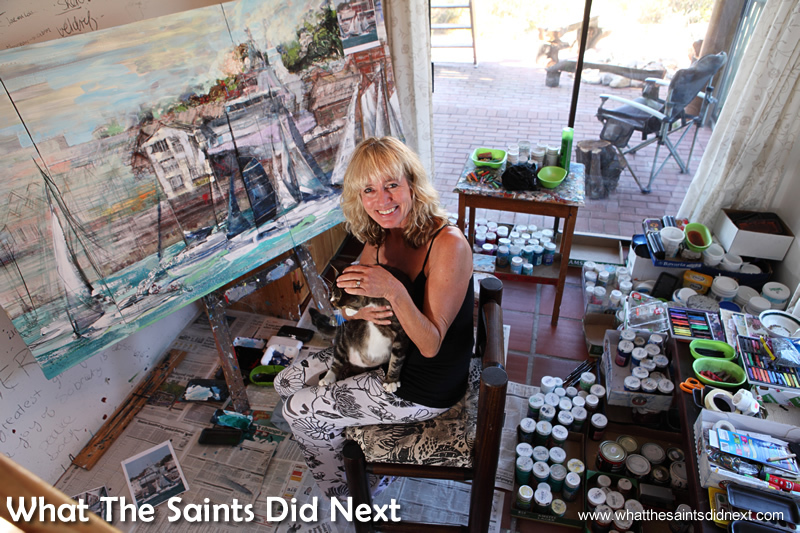 Although Diane graduated in art and fine art from Rhodes University, and studied additional printmaking in East London, painting has always been a hobby up to now; an escape from her sales rep job which has her on the road much of the time. The decision to begin selling her paintings is a very recent one; she’s been at the gallery only a few months. The philosophy of the ‘Tangled Webb’ gallery is, let art be an essential element of life. 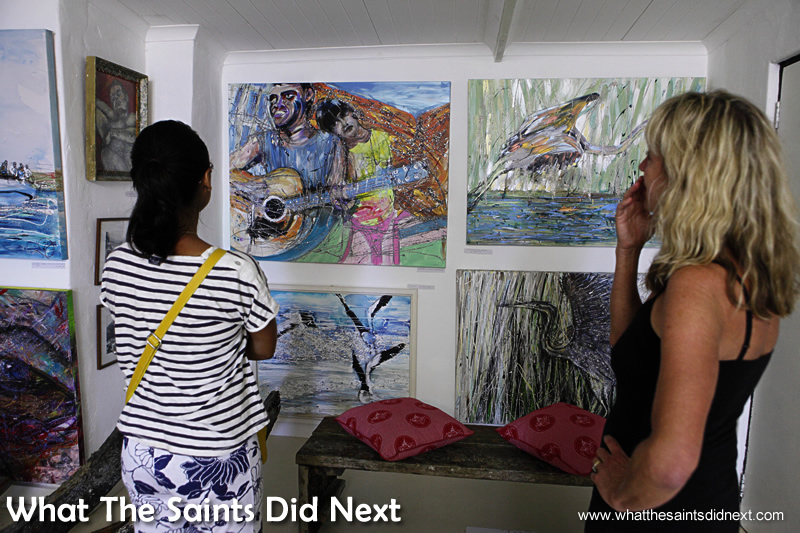 All of the paintings in the gallery are for sale and Diane has a special connection to each piece. 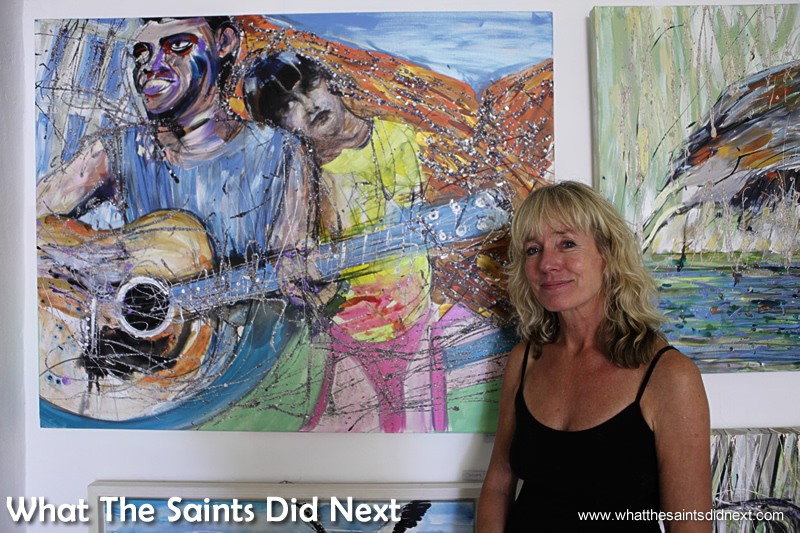 “There are some like Wayne’s picture I’m particularly attached to.” The scene in the painting was late afternoon on St Helena Island, Diane and her friends were singing along, Wayne was in his element. Looking on was his partner’s 4 year old daughter. Caught in the occasion she quietly got up and rested her head on his shoulder, just to be closer as Wayne played the guitar. 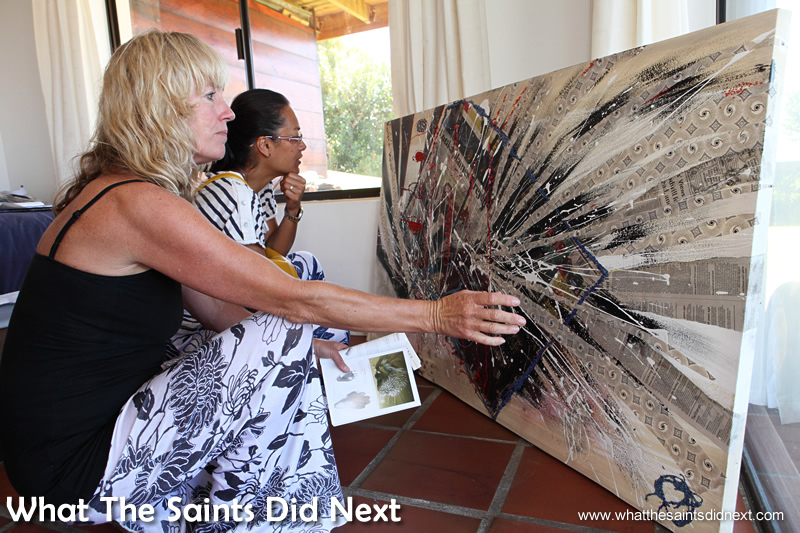 Touched by the moment, Diane returned home and recreated the scene on canvas, capturing the mood and essence perfectly. It’s been a good day. I’ve met an artist whose talent matches her passion, and it’s moved me to tears. 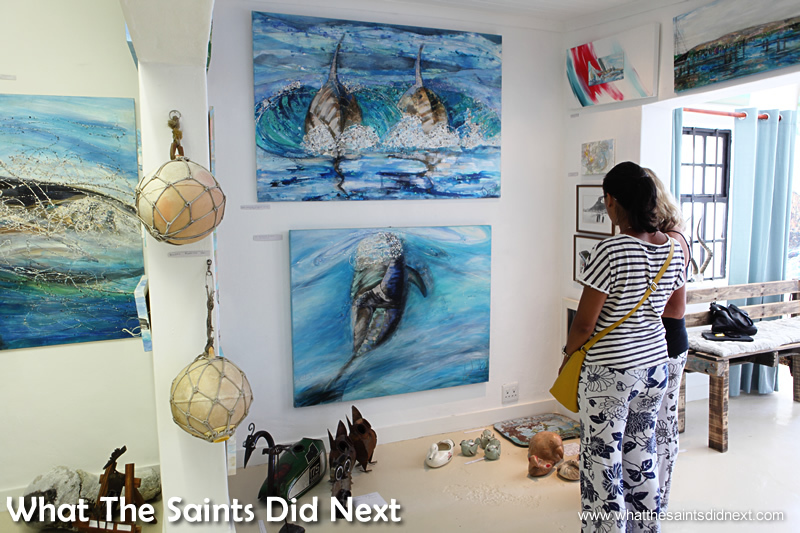 The Tangled Webb Gallery, De Palm Lifestyle Centre, 8 Shearwater Street, St Helena Bay, South Africa. It really was Terri – pretty spectacular. A very special and emotional writing about a lovely person by a lovely person. Great reading, thanks Sharon. 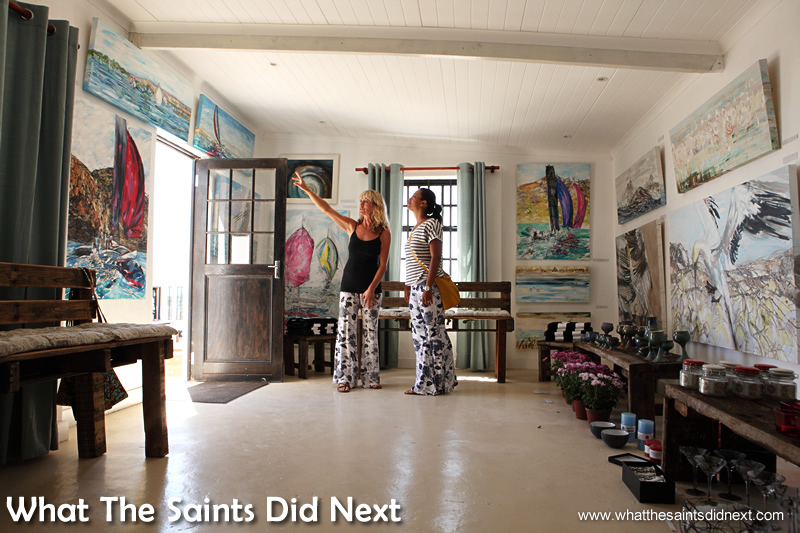 Thanks Debby – the painting really captures the moment. Darrin pointed out it’s a ‘moment’ we take for granted on the island not realising it’s significance. What a lovely emotional story. Sharon you enjoy every moment of your holiday! 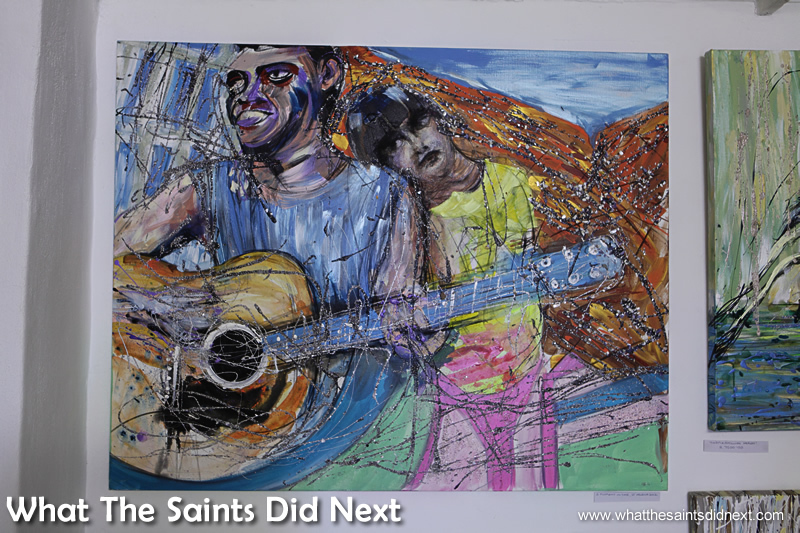 Thanks Alice – I could almost hear Wayne playing the guitar when I saw the painting.